Natasha Richardson’s tragic death after a skiing accident has spawned at least one happy ending: It inadvertently saved the life of a little girl. 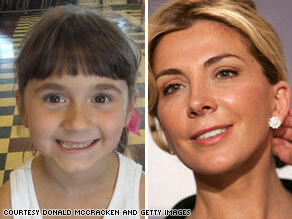 An injured Morgan McCracken has benefited from awareness after Natasha Richardson’s death. After Morgan was helicoptered to a children’s hospital in Cleveland, the chief of pediatric neurosurgery, Dr. Alan Cohen, informed the McCrackens their daughter had the same injury that killed Richardson: an epidural hematoma. “My heart sank. It just sank,” Donald says. But now, after undergoing surgery and remaining hospitalized for five days, little Morgan is back home and doing just fine. “Dr. Cohen told us that if we hadn’t brought her in Thursday night, she never would have woken up,” says Donald. You are currently browsing the archives for the epidural category.